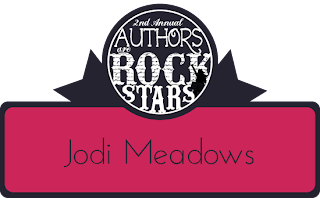 I am so excited to have Jodi on the blog today, because she is one of my very favorite authors EVER. Basically, she’s a rock star. I’m sure you remember my raving reviews of Incarnate and Asunder. One of my favorite things about Jodie is that we’re on the same wavelength. Her writing style meshes so perfectly with my imagination, that I see everything in my mind a split second before I read it. This doesn’t mean that her stories are predictable. It means that her writing gives me everything I could want. And more. Her world building is immaculate, she writes a pretty swoony male lead, she is the master at writing romances and tension, and you can just tell from her lyrical writing that she loves music just as much as I do. Just READ some of these quotes, people. Honestly. I’m almost always speechless after closing a book of Jodie’s. She’s also pretty funny, especially when she talks about her beloved ferrets. I just know that we’d have so much fun chatting over books, chocolate, and love stories. 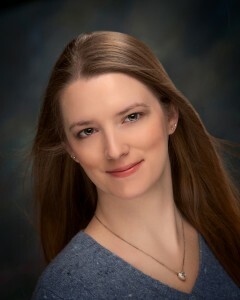 Jana: Jodi, I am SO excited to host you on my blog today! I absolutely loved Incarnate and Asunder, and I am dying to find out more about Ana and Sam, and what’s in store for them in Infinite! Thanks for stopping by to answer a few questions. :) Incarnate introduces its readers to an amazingly unique take on reincarnation. I love that the characters remember their past lives, and have taken those memories and lessons learned with them into their current life. What was past-life Jodi like? Jodi: Into stories, probably. Writing, reading, music. Past-life Jodi probably had better handwriting because the computer wasn’t around. Though maybe she would have lost all ability to write legibly thanks to the typewriter. I guess it depends when past-life Jodi lived.Past-life Jodi probably wished she could explore the galaxy like on STAR TREK, too. Jana: I think we’d all love to explore the galaxy! Ana is a brand new soul with no past lives at all, and Sam is a guy who has been reincarnated many times. And they fall in love. The age difference is quite massive, yet their relationship is so normal and believable. What kind of planning did you have to go through in order to have their story come off as romantic rather than strange? Jodi: I knew early on that Ana and Sam had to have some kind of connection besides the hots for each other’s bodies — something real and soul-deep. That connection was music. I think having their friendship be based on something like that helped a lot. I was also careful to mention that their relationship might be strange. Some characters think it’s weird and wrong, while others believe they were meant to be together. Ana and Sam do have to deal with their massive age difference. But while they know their romance is unusual, that doesn’t make it any less real for them. It helps, I think, that they’re both aware of the strangeness, and consider all the issues. They’re both mature enough to make decisions — together — from there. Jana: Wow, I love that! And I love that the maturity surrounding their relationship is so believable. It made me love them so much more. Ana’s appearance causes a major rift in the world. She’s ostracized, belittled, mocked, and feared. I think we’ve all had times like that in our lives, of constantly wanting to prove that we’re more important than we’re given credit for. Her feelings and struggles were portrayed in such a real way, that I can’t help wondering if a little bit of you was written in her. Is that true? Jodi: Those are pretty universal feelings. We all know what it’s like to feel excluded and belittled. We’ve all been new to something — school or work or towns, or even situations we’ve never before encountered. So I think there’s a little bit of everyone in Ana. Including me. Jana: That’s a beautiful concept. I love that Ana was written in a way that everyone could relate to her on some level. Sam is still my absolute favorite male in young adult fiction, because I love his wisdom, his musicality, and his compassion and capacity for love. Is he inspired by anyone in particular? Jodi: My characters appear in my head fully formed; they’re never based on anyone in my real life, though sometimes I notice similarities between people I know and the people living in my head. Sam, though . . . I knew he had to be kind and gentle and compassionate in order to reach Ana. Her past was such that no one but the most empathetic person would be able to help her overcome what she’s been through. Which isn’t to say that he doesn’t make mistakes! He makes plenty over the course of their relationship, but that kind and honorable part of him always shines through. Jana: *swoons* I just love Sam! Music plays a huge role in the Newsoul trilogy, which I love. It is practically a character all on its own. What made you decide to make music such a strong part of Ana’s and Sam’s stories? Jodi: As I mentioned earlier, I needed something strong to connect Ana and Sam. Music is a universal language. It affects everyone somehow. For Ana, music became her lifeline. It was the thing she had when she had nothing else. It was what kept her going through her entire childhood. And Sam connects with her using that. Also, I love music. It’s always been a huge part of my life. I took dance all through my childhood and teenage years, so music is also a very physical thing for me. And I played the flute through middle and high school. (I still have my flute and bring it out occasionally, but not as often as I should.) I’ve always felt a strong connection with music; it seemed natural to give something like that to Ana and Sam. Jana: See, I love that! I’ve always connected deeply to music, and I’ve never read a book that depended on music so much. It worked so amazingly well, even though a book is silent. With movies, you can have pretty scores accompany the story, but with a book you don’t have that luxury. On that same note, if Incarnate were a song instead of a book, what would it sound like? Jodi: I actually do have a piece one of my readers showed me. 3055, by Olafur Arnalds. I’d describe it for you, but you should probably just listen to it instead. Watch the video, too. It’s wonderful. Jana: Wow. That’s beautiful! I love it. And that video reminds me so much for Sam and Ana. So… the masquerade ball in Incarnate had me swooning more than I care to admit. It was absolutely beautiful, and I loved the message it portrayed. (For those who don’t know, The ball is held for two souls who have pledged their undying love for one another across all their incarnations, even if sometimes one of them happens to be 80 and the other one 5. Or… if they both happen to come back as members of the same gender. It’s their souls that matter, not their bodies or age. So they celebrate all of this with a masquerade ball, where nobody knows who anyone is dressed as. The goal is for this couple to find each other anyway.) I love the underlying message of love being eternal, and having no bounds. Is there a love like this in your life? Jodi: The masquerade is one of my favorite parts, too! Swoon all you like; there’s no shame in it. :) And yes, I do have a romance of my own. I met my husband online in a chat room (completely unrelated to romance). We started talking over instant message, then over the phone, and after about six months of that, he flew to Texas where I lived, we drove back to Virginia, and got married. A lot of people said it wouldn’t work, and looking back, I see how they thought it was dangerous. But I knew then that it was right, and here we are ten years later, still very much in love. Jana: Wow… What a fun story, and so romantic! I love hearing how couples meet and fall in love. As we move from Incarnate to Asunder, we start to see a stronger emphasis placed on emotions and feelings. We see Ana start to change and value her purpose in life more, and we see the more human side of Sam–flaws and all. What’s in store for us in Infinite? Jana: Ah, I’m so excited! I heard we’re getting a prequel novella from Sam’s point of view, which I am SO excited about! Can you tell us a little about it? Jodi: I’m excited, too! Phoenix Overture revolves around a major, major choice Sam had to make early in a past life. If you’ve read Asunder, you might even be able to guess what choice that was. Stef is there, as well as some other familiar names. Jana: That sounds awesome! I just know when the Newsoul trilogy comes to a close, I’m going to die a little bit. You’ve got a new project in the works, though, from what I’ve heard! Are you sworn to secrecy, or can you give us some details? Jodi: I’m mostly sworn to secrecy for now, but I can tell you a tiny bit. The Orphan Queen is about identity, parents’ legacies, and believing in oneself. There’s kissing, swords, and people wearing pretty, pretty outfits. Jana: Oh, how exciting! The Orphan Queen sounds so wonderful. I have a couple questions left for you, just for fun! If you could be a character in someone else’s book, who would you choose and why? Jodi: Oh gosh. What is the book with the least conflict that’s mostly about kissing and reading and drinking coffee? I want to be in that book. Jana: Haha. I think we all would! Tell us about your favorite knitting project. Jana: That tank top is so pretty! 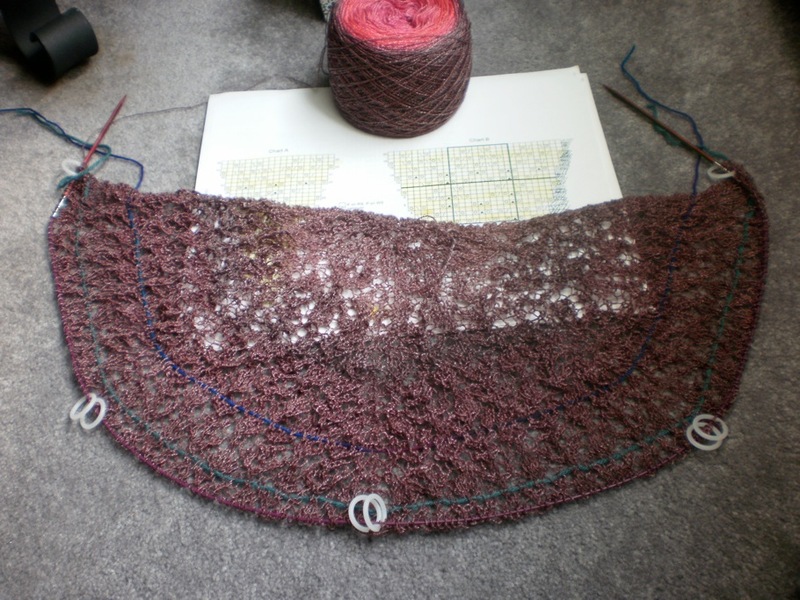 The shawl also looks like it’s coming along nicely, although I’m not a knitter so I might not be seeing everything I should be seeing. 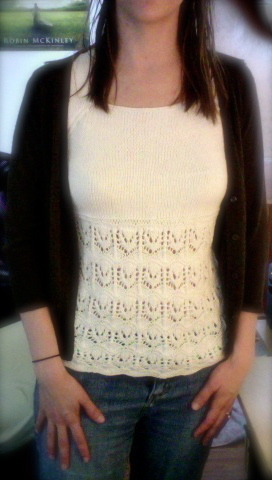 I should learn to knit. That would be awesome. Tell us about these ferrets you speak of. Jodi: I have two ferrets right now, Todd and Hiro, though I’ve had others in the past, up to seven at once. (It was just as crazy as you might imagine.) 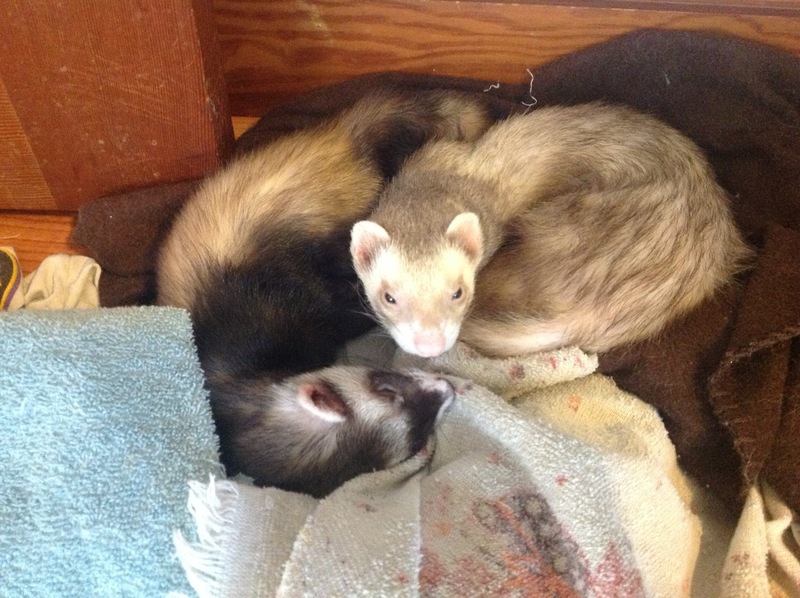 Mostly, the ferrets sleep, but sometimes they get up to bounce around and wrestle with each other, or stash their junk in boxes or their cage. Sounds like a pretty good life, right? Jana: Oh, to be a ferret. They are so cute! I can’t imagine having seven, though. I bet that’s a ton of work! What kind of chocolate did you eat the most of last month? I’m partial to Dove milk chocolate. Jodi: I also like milk chocolate best! I’m not sure what I ate most of last month, though. I mostly don’t remember last month, as I was too busy writing Sam’s novella to do much else. Did we really have a June? I had just a Sam. Jana: Haha. You had a Sam. I can’t help but giggle at that! What’s the funniest or most memorable thing a devoted fan has asked/said to you? Jodi: All of my readers are wonderful, and I love them, but one of the funniest things was when one brought me a wooden spoon to an event, because I’d mentioned on Twitter once that I didn’t have one. Now I have one. Crisis averted? Jana: Oh, that is hilarious! What an attentive fan! Is there anything else you’d like to add? Jodi: I’m currently drinking coffee out of a Hooray for Books! mug. I think that makes the coffee taste even better. Jana: Hehe. Books make everything better, that’s for sure! Thanks so much for stopping by, Jodi! Best of luck with the upcoming release of Phoenix Overture, and the 2014 conclusion to the Newsoul trilogy, Infinite! 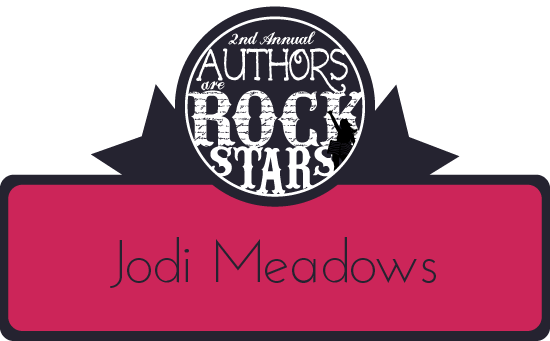 I just loved chatting with Jodi and getting to hear more about her books, both released and unreleased! If you have not yet picked up the Newsoul books, or if you’re not ready for the upcoming releases, I highly suggest running to your bookstore and picking them all up! Awesome post! 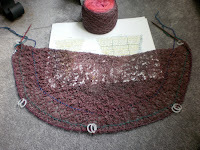 I always love Jodi’s knitting pics! Thanks so much for being a tour host. It’s so amazing to connect with an author like that. I’ve added Incarnate to my Amazon wish list. I love the covers of her books – the whole masquerade thing seems like it really fits the story line.